A Saturday morning group ride visited the Templeton Farmer's Market, while catching a brief bottle refill. While the city of San Luis Obispo, as well as its neighboring communities, may serve as home base, a headquarters of sorts for daily spins, North County San Luis Obispo offers a gateway to gravel, true exploration, and the ability to escape a sense of hustle-and-bustle. In North County, there seems to be a sense of ease, especially with the rising sun and brisk morning air. Eventually, this gives way to a prominent tourism industry, which is dominated by North County viticulture. 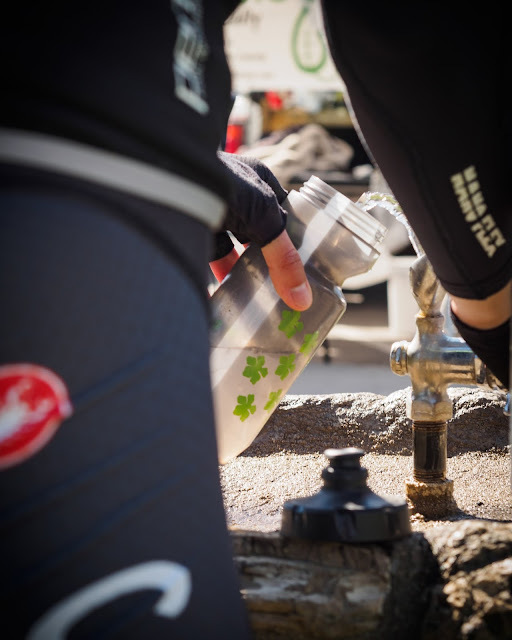 On this Saturday morning, while in Templeton, California, Ryan Mostofi, a centerpiece for Cal Poly Cycling, snatched a bottle refill, amidst the morning Farmer's Market. Soon, Everjourney will be selling additional water-bottle designs, all under the More Sending, Less Pretending moniker. Be sure to stay tuned to our shop tab. This shot was captured by Adam Evard, a current student at California Polytechnic State University, San Luis Obispo. Adam has contributed a plethora of images to Everjourney. He's a real one. Give him a look: @aeevard.